Slate is a metamorphic rock derived from fine silt and sediments of clay. Slates can vary in structure, composition and durability mainly due to the constant alteration of all the minerals that are rather inconsistent within. Slate is already known for its increased durability and strength like that found in the case of marble or granite. This is the main reason why slate is used for kitchen countertops. 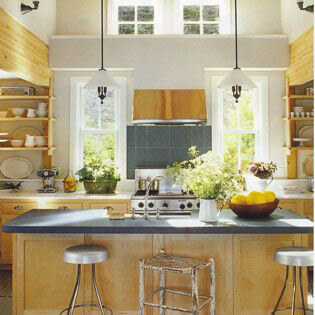 Also, it can provide sophistication and elegance to any kitchen space. Another reason why slate countertops are popular is because such countertops have a very low absorption rate thereby being less likely to become a beneficial environment for bacteria growth and more stain resistant when compared to other kitchen countertops. While most slates are likely to come in darker tones, you can also find slate countertops available in shades such as blues, greens, reds and purples. Also, slate countertops can be easily kept clean and they are low maintenance as well. All you will have to do is to use a household cleaner in order to clean your slate countertop. Also, using mineral oil is recommended in order to protect the slate surface. Even if they are impervious to water, heat and stains, regular polishing is required in order to maintain the original shine of the slate countertop. Many natural stones are quite expensive when it comes to using them for kitchen countertops. However, slate is among the most economical materials and this low cost has already made slate countertops available in a wide range of shapes, sizes and colors. Also, slate countertops are available in a wide range of finishes such as smooth polished looks, rough surfaces or soft honed finishes. Even if it can be cracked or chipped, a slate countertop can stand a lot of abuse as long as you install it in the right way and maintain its properties by using the necessary chemical treatments. Being a natural stone, slate can provide a wide variety of characteristics, thus offering you plenty of options to customize your slate kitchen countertop.